Another enjoyable weekend, though wet! Alvin was booked to come but illness prevented him, so there were just 12 people to fill the 13 places in the three chalets Rowan, Birch, and Beech. 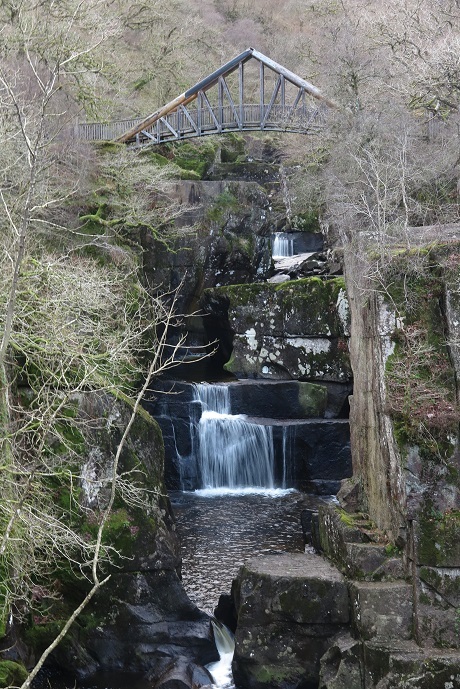 Mick, Jan, Kevin, Norman, Alan, and Hugh stopped off in Callendar to eat their sandwiches and to visit to the Bracklinn Falls: well worth seeing. 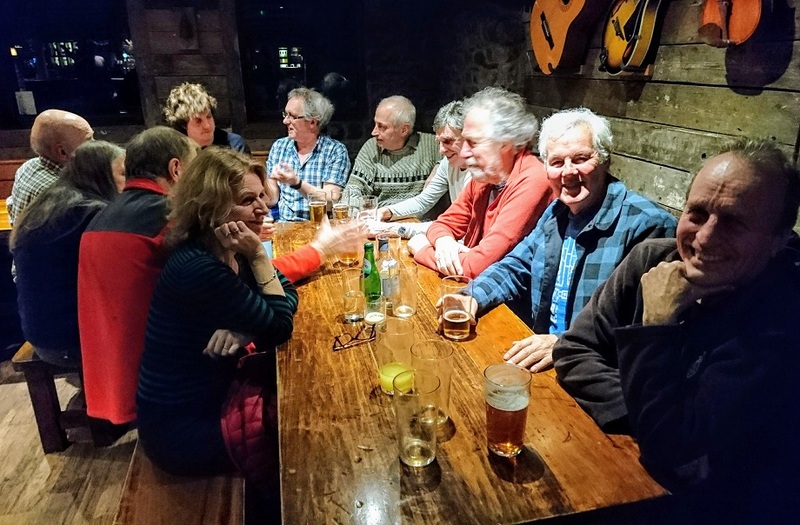 Friday night saw a great array of beers in the Clachaig bar, mainly due to poor visitor numbers over Christmas and New Year. 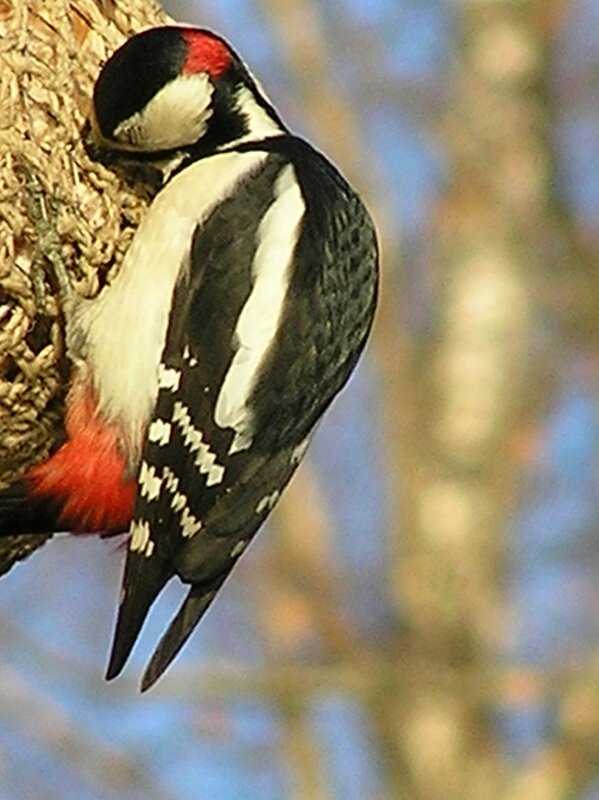 Saturday dawned damp, and an early start was made to try and beat the forecast of worsening weather. 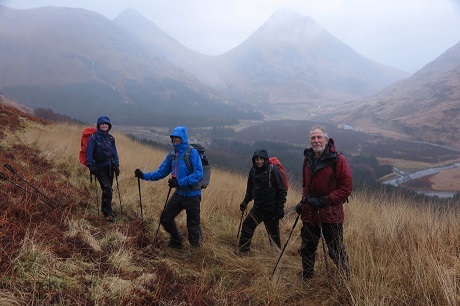 Mick, Jan, Kevin, Norman, Alan, and Hugh drove down Glen Etive, and whilst Alan walked further down the glen, the other five ascended the Corbett Beinn Maol Chaluim: very steep with drizzly weather and increasing wind speed. Mel, Charles, Mick, Adam opted for the Munro Meall nan Eun on the other side of Glen Etive, with Mel and Adam topping out. Veronica and Graham took the sensible option and avoided the rain by driving out to the light house at the end of Ardnamurchan. The music that night was provided by a duo playing flute, saxophone, guitar, fiddle and highland pipes to backing tracks. There was lots of potential for some interesting music including improvisation, but their PA let them down somewhat. Sunday dawned damp, and a steady drive home was made via a coffee stop at the Kingshouse at Balquidder. Three chalets have been booked provisionally for 2020, Oak, Rowan, and Birch, giving 14 places. 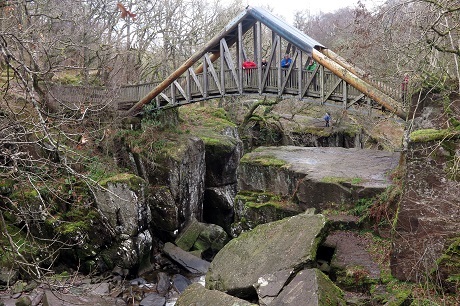 The bridge at Bracklinn Falls. Some of the falls below the bridge. In the Clachaig bar on Friday night. Going round the table anti-clockwise from the right: Mick Fox, Norman, Hugh, Alan, Mick Robson, Charles, Adam, Graham, Veronica, Mel, Jan, with Kevin taking the photo. 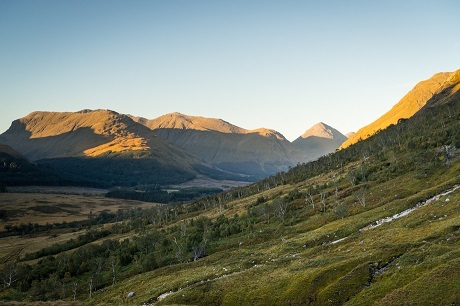 Beinn Maol Chaluim is seen here on the left with its long summit ridge. 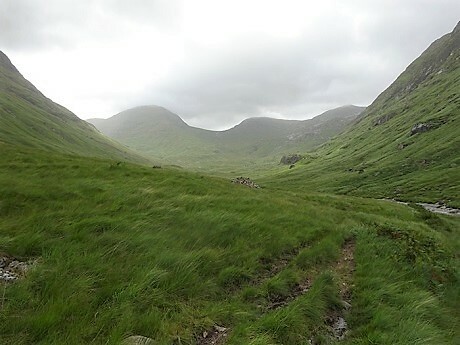 The photo is taken from the web site of the John Muir Trust, which is objecting to three of the seven proposals for hydro schemes in the glen. Our route led up through the only break in the forest on the right hand side. Ascending Beinn Maol Chaluim, with the shapely peak of Stob Dubh behind on the left and the slightly more rounded peak of Stob na Broige on the right. From left to right: Jan, Kevin, Mick, Hugh, with Norman taking the photo. 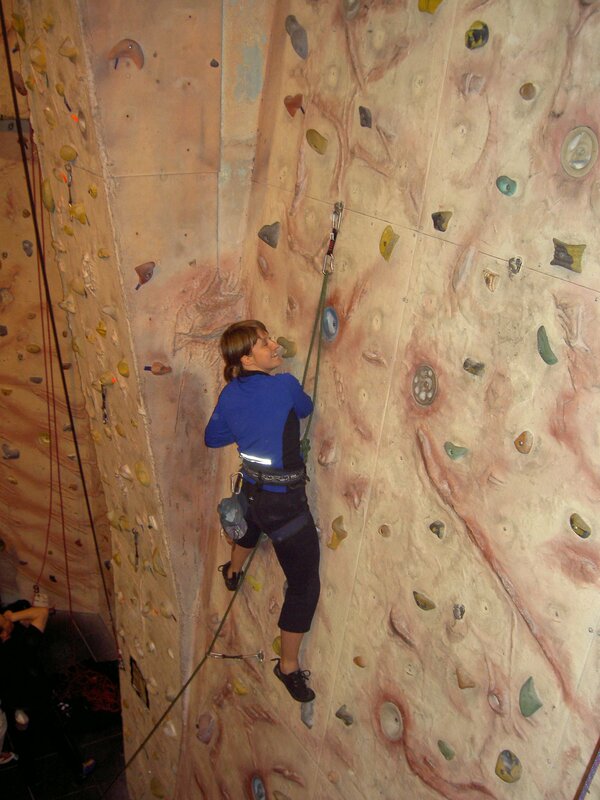 A photo from the internet showing the terrain on the ascent. Someone described the hill as A bit of a beast of a hill, with some seriously steep sections. The summit ridge is brilliant, and I got a couple of glimpses of the view through the persistent mist and the rain. 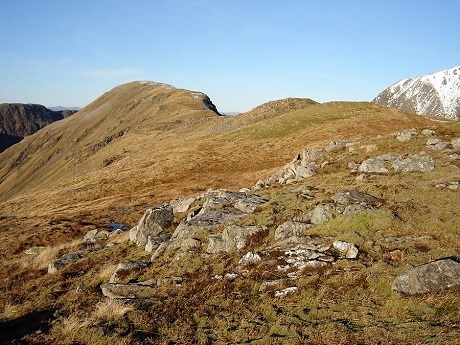 Mick Fox adds that the false summit is in fact listed as a top in its own right on the Hill Bagging website: Beinn Maol Chaluim South Top, and for those interested in categories of hills, it is a Subsimm. For those interested in that kind of thing - A Simm is a hill in England, Wales or Scotland over 600m high with a drop of at least 30 metres all round. 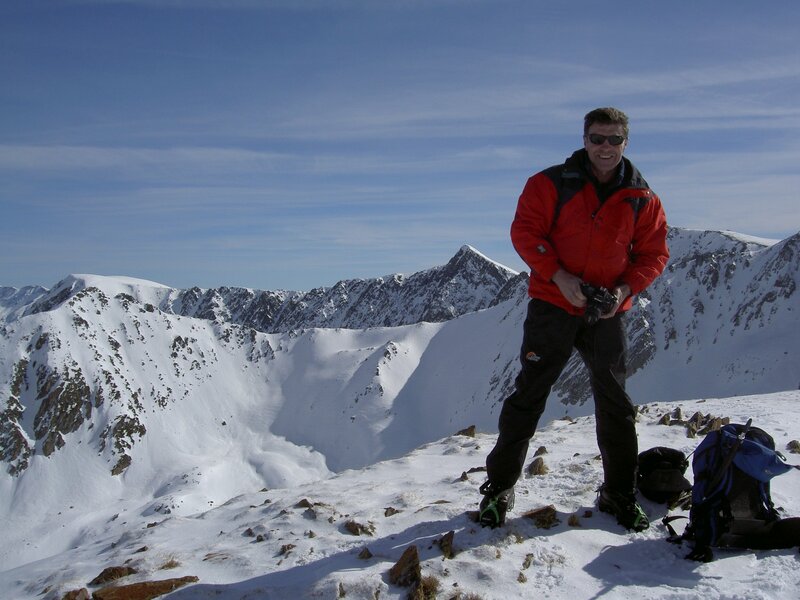 Simm is an acronym for Six-hundred Metre Mountain. A Subsimm is a hill which just fails (by up to 10m) to qualify on the drop rule, i.e. over 600m with 20-29m drop. Mel, Charles, Mick, Adam opted for the Munro Meall nan Eun, ascending up Glen Ceitlein and then the hills north west ridge. 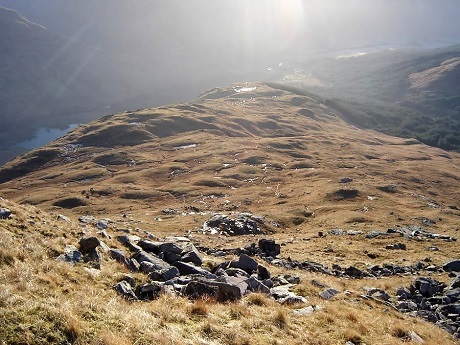 This photo from the internet is looking up Glen Ceitlein with the north west ridge centre right. 15 Fellfarers & friends and 4 dogs met up on a rather damp morning to walk up Cunswick Scar for the annual Charlie's Walk. 5 continued on to Staveley and 6 to the Union Jack for a late lunch. 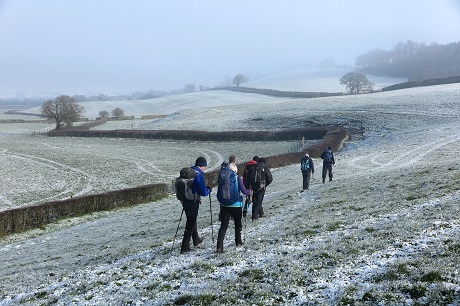 The first decent fall of snow of the season came in the third week of January, which together with the cold conditions created an almost alpine feel to the fells. 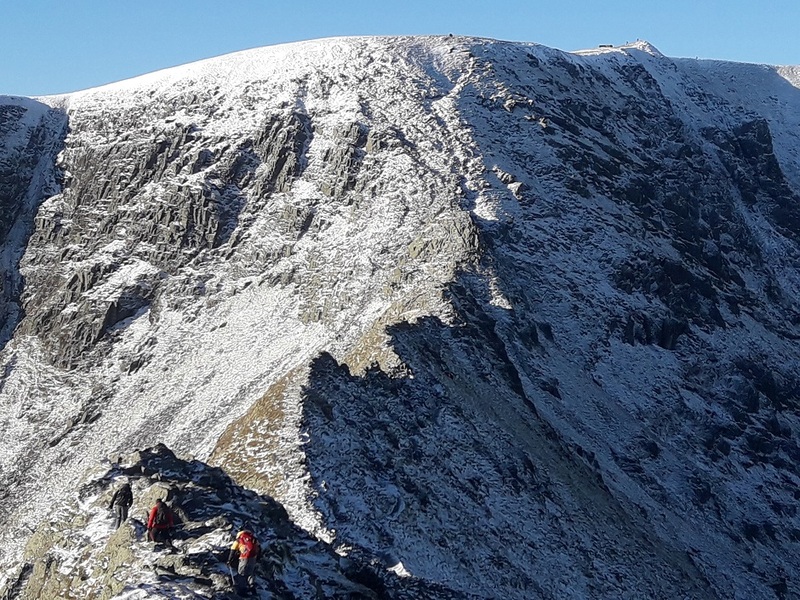 This great photo of Striding Edge was taken off the Weatherline web site. Get out there! A generally damp weekend, with a walk round Buttermere on Saturday, and a meal in the Scafell in the evening. The view from behind High House on the Sunday morning, with a decent dusting of snow on Grey Knotts. Another great look back at what club members got up to in 2018, put together and presented my Mick from photos submitted my members. Stickle Tarn in the foreground, with Harrison Stickle behind. The weekend snow above lingered, and was added to a few days later. Wednesday saw superb weather, but the soft powdery snow made for hard going. I recently decided to take up Kendal Mountain Search and Rescue Team’s invitation to Fellfarers to witness the dedication of a Rowan, planted in Kentmere, in memory of Rod. Some thirty team members attended on the 12th November, Remembrance Sunday, a day of clear blue skies and near perfect visibility. The dedication saw Team Member John Everett talk outlining Rods time with the team and this was followed by team members relating their feelings for and experiences of Rod, these tales all brought to the fore Rod’s unique character that many of us grew to appreciate. The one phrase that really stuck in my mind was he was a “gentle gentleman” so true. The gathering concluded with a silence to mark Remembrance Day. By the end of the month, the snow was thawing leaving only a dusting on the tops. Here is Langdale from Silver Howe. On a cold and frosty morning, 10 members met in the excellent Hornby tea room for coffee. Ruth then led the group west alongside the river Wenning before turning north when the the Lune was met. Grey herons and goosanders were seen on the river, and at Loyn Bridge the group left the river behind for the motte and bailey of Castle Stede. The site of one of eight early Norman castles between Lancaster and Kirkby Lonsdale, it is now considered to be the best motte and bailey in Lancashire. Still in the gloom of low cloud hugging the river, the group headed over the shoulder of Windy Bank (which wasn't) where up to 50 pairs (Kevin's counting) of swans were seen in the fields below mingling with the pink daubed sheep. As height was gained, the group broke through the low cloud to produce some lovely atmospheric views. Lunch was eaten in the graveyard of Tatham church which is dedicated as St James the Less (??) 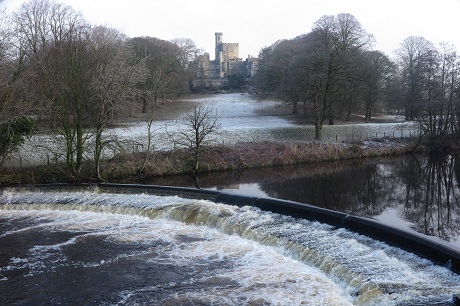 - perhaps La'al Jimmys.. Then still heading east-ish the group crossed the River Wenning and the disused railway line from Lancaster to Wennington and up Park Lane before turning south heading for Mealbank in the River Hindburn valley. As the Wray main road was approached a barn owl was seen hunting in the field below (or was it a short eared owl?). The homeward stretch went through the fields back to Hornby, where the walk was finished in grand style in the tea room. 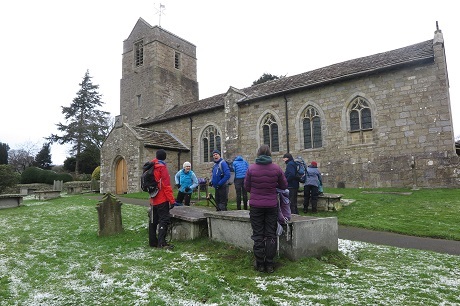 Ruth counted that we had climbed over 29.5 stiles (the 0.5 wasn't really a stile) making it the leading contender of 2019 for the walk with most stiles. Thanks for a lovely walk Ruth. At the start of the walk, from left to right: Kevin, Clare, Roger, Mick, Norman, Ruth, Frank, David, Jenny, with Hugh behind the camera. Approx 50 pairs of swans (probably Whooper) mingling with the pink sheep. According to Roger, a group of swans are most commonly called a bevy but also a bank, whiteness herd, eyrar or a gargle, unless they are flying when they are a wedge. Norman researched afterwards - 'James the less' is an early figure of Christianity; he is also called 'the minor' , 'the little', 'the lesser' , 'the younger', according to translation. He is not to be confused with 'James, son of Zebedee' ( James the great). Again from Roger - The chap who lived at Hornby Castle was involved in building the local railway line. At the same time the Castle became infested with rats, so he imported several cats which solved the problem. He was so pleased that he named a railway bridge Cat Bridge. 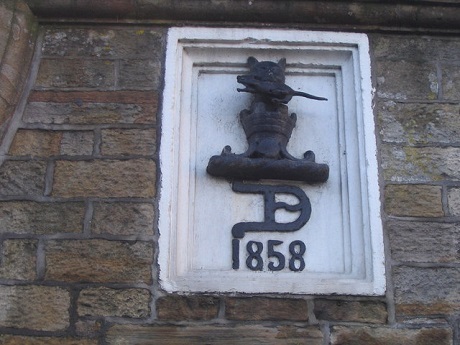 It was eventually demolished and the plaque from it is now part of the water fountain in the village. I knew there was a tale of some sort!